Chase a Paper Rainbow: Out of my comfort zone! This card was created for a friend's birthday! Topper - Use Marianne Craftables Die Flower Basket (CR1209) twice, once with plain white card, and again with bright, flowery paper. Colour the basket and handle with Copic E31. Trim the flower section from the flowery paper and glue it onto the plain basket. Leave to dry. 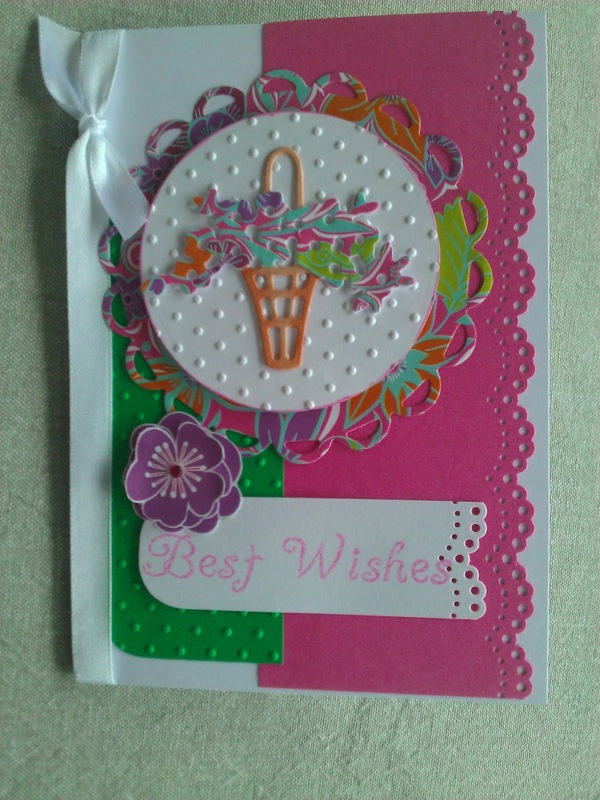 Cut a plain white circle and a flowery paper scalloped circle using Nestabilities. Emboss the white circle with Swiss Dots embossing folder in Cuttlebug. Cut a long rectangle from plain pink card, use Martha Stewart Doily Lace edge punch down one long side. Cut a small rectangle from plain green card, emboss with Swiss Dots embossing folder in Cuttlebug. Cut a small flower twice from matching paper. Layer with foam tape. Stamp sentiment in VersaColour Orchid ink on white cardstock. Assemble as shown, using foam tape under white circle.